Debt Reduction Services has several accreditations and free counseling. do they offer credit counseling services? are there certified counselors on staff? is this business ISO certified? Debt Reduction Services has been operating for over 21 years and helps customers in 47 states to reduce their debt by way of consolidation and debt management plans. There are a lot of attractive aspects to its services, including their availability, money-back guarantee, and accreditations. However, there are also complaints about the company employing pushy sales reps and aggressive telemarketers. If you’re not sure what to do about the debt that you have, Debt Reduction Services offers a free consultation to anyone, regardless of whether or not you actually enroll. We like to see this kind of offering from companies. Additionally, on its list of resources, Debt Reduction provides an attorney listing under each state. This tool enables consumers to easily find an attorney if bankruptcy is determined to be the best option. Debt Reduction gives clients peace of mind when it comes to satisfaction. A money-back guarantee is offered, and the company claims clients’ financial success is its ultimate goal. If a client is unsatisfied with the results, the company will refund the enrollment fee. In some instances, it may also refund some of the monthly installments paid to the company. Debt Reduction Services is not transparent about its interest rates, monthly fees, or up-front fees. Some customers have reported seeing their fees increase after signing a contract. Overall, we’d like to see companies, including Debt Reduction Services, be more transparent about their fee-schedule, especially as this company is a non-profit firm. This lack of information can make it difficult for potential customers to determine if Debt Reduction is the right fit for their circumstances. It is also difficult for our team to rank them without the pertinent information. Complaints about Debt Reduction Services seem to have less to do with the company’s services and more to do with pushy salespeople and aggressive ‘hard-sell’ tactics as they try to get people to sign up for their service. This can be very off-putting for customers and push them into services they do not want or to find another company to work with. 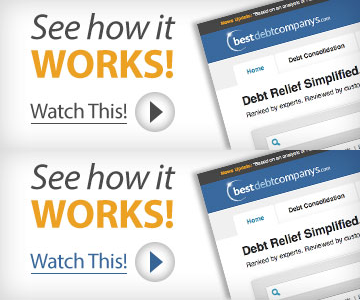 Want to See the Top-Ranked Debt Consolidation Companies? Debt Reduction Services might be a good fit for many people who live within their 47-state service area; they have a money-back guarantee and are well accredited. However, their lack of transparency and aggressive sales tactics should be considered before committing to using their services. Because of these factors, we do not recommend working with Debt Reduction Services at this time. Debt Reduction Services is a non-profit debt consolidation agency that provides customers with the ability to gather all of their unsecured debt into one easy monthly payment and negotiate to lower or eliminate interest charges. On average, Debt Reduction Services customers have been able to pay off all of their debt in approximately two to four years. Debt Reduction Services also offers credit counseling, bankruptcy certificates, and several financial resources, like financial education and credit/debit discussions. Debt Reduction Services price information is undisclosed at this time. The company provides free consultations over the phone. Their consultants are very well informed and polite, so you should feel very comfortable taking advantage of this option. Debt Reduction Services was started on May 01, 1996, in Idaho. They have been in business for 21 years. Along with their free consultations, Debt Reduction Services has a blog called “Credit Counseling Talk”. It covers a wide range of topics, including debt collection and identity theft protection. The most exciting part of their debt education offering are the free webinars and trainings. These are recorded for individuals to watch whenever suites their schedule best. They offer weekly 60 minute long trainings in their office for locals, or anyone that happens to be in town. They also offer seminars in outside offices and a free financial tips newsletter called eTips. Overall their debt education is very good. Debt Reduction Services will not refund any money that you have already invested into the program, although you are free to cancel your services at any time. Any money that you have given to creditors while part of the company’s debt consolidation program is safe and considered paid. They put a lot of effort into insuring that your information is safe. From all that we’ve seen, you can feel confident that they will take care of any information you provide them with. They assist with unsecured loans only. Debt Reduction Services website is not mobile friendly, so your best option is to work off of a desktop or laptop. One positive is a button in the top right-hand corner of the site that lets you view everything in Spanish. Debt Reduction Services wants to see you succeed, but understands that sometimes the customer wants to take a different route, so you can cancel your work with them at any time. Though, by doing so, you will forfeit any fees that you have already paid the company. Since Debt Reduction Services pays creditors monthly, you won’t have to worry about those payments being lost if you cease working towards consolidation. Debt Reduction Services is a non-profit “management and credit counseling organization”. They specialize in debt consolidation and debt management, which means that they will work with creditors to achieve a single, low-interest monthly payment, with resolution usually in 5 years or less. One of their top features is a Client Center, where customers can view their progress and previous payments. They also offer “Pre and Post Bankruptcy Filing Certificates” when bankruptcy is the appropriate option. The company does not have a minimum debt threshold. Yes, Debt Reduction Services has an online portal for their customers. After a customer has made their first payments, they are able to see an estimate of their balance. Besides the estimated running balance, the dashboard also shows how much of their payment went to each creditor and when those payments were made. Debt Reduction Services’ credit counselors are certified through the Center for Financial Certifications, an independent credentialing body recognized by the debt management industry and individual state regulators and creditors. Debt Reduction Services is certified compliant by BVQi NA,Inc. to the ISO 9001:2008 Quality Management System Standard in order to ensure the highest level of quality service to their clients. Debt reduction help me so much with my student loans. I would greatly recommend all students to use this service to help reduce your debts. Service was outstanding, I would recommend them to a friend. I have had excellent customer service with Patience R. I would rcomment this company to anyone. I have had great customer service from Patience R and David B. They are walking me through this process of debt consolidation, I am so grateful. Would recommend them to anyone.